Spring officially started and the first flowers are popping up, excellent start thinking about going outside again and joining our spring excursions. 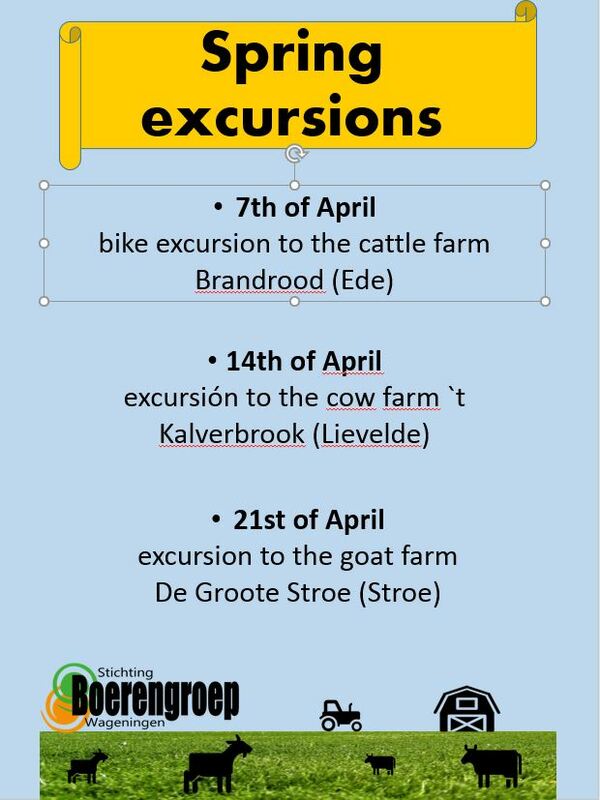 In April we’ll have 3 Spring excursions: the first will be on the 7th of April and will be to the Brandrood cattle farm in Ede, the second will be on the 14th of April and will go to ‘t Klaverbrook, dairy farm of a Wageningen student who loves to show you his place and the third will be on the 21st of April to the goat farm de Groote Stroe in Stroe. This farm’s name refers to its cow race: ‘’Brandrood’’, with a reddish colour. But there are some donkeys, sheep, chicken, cats, horses and goats around too.. a true animal party. At the farm you will have the possibility to discuss with the farmers about their ways of farming. Interesting questions to discover: How they go about the new phosphate regulations in the Netherlands? How do they make, market, sell their cheese? Why did they choose for this type of cows? How is it to be a ‘small-farmer’? We will go to this farm by bike, it is a lovely ride through the nature area around Wageningen. Cheese tasting is included and we suggest you to bring some food, so we can have a picknick before biking back to Wageningen. They make very tasty cheese which you can buy amongst others at www.kardoen.nl in Bennekom or at the Boerenmarkt in Utrecht. So come along to this farm, meet the goats, and ask all your questions to the farmers. Cheese tasting will be included.